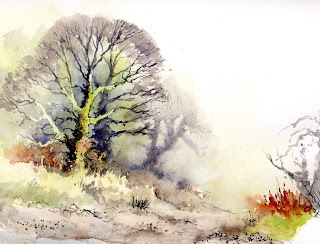 This entry was posted in aerial recession in landscape paintings, atmosphere, David Bellamy, recession, Simplification, sketching, sketching in rain, Sketching in winter, sketching outdoors, watercolour sketch, wet in wet technique, Winter landscapes in watercolour, Winter trees in watercolor by David Bellamy. Bookmark the permalink. I love your writing, almost as much as your painting ! Wherever we are, you take us to the place where you are and show us what you see. Then you clearly explain how you achieved, and we can try to achieve, the lovely pictures you paint. I have been looking out for quite a while for any explanation describing how you used tissue, decorated with dots, on snow scenes, to achieve a really interesting effect. I understand that you may have written something about it in one of Leisure Painter magazines, but I can’t find it. Could you please tell me which edition it is in – I am getting desperate! Many thanks for your continuous encouragement to all of us who have such fun painting, and now and again achieving something which really pleases us! Thankyou so much for replying so quickly. I will keep an eye open for the article. A very effective sketch. I cannot get out in this way so it is good to see a rel artist working with prevailing conditions. I loved you cheerful email on a grey January day. I bought your book Skies, Light & Atmosphere before Christmas. I love the Cover Picture. Have you a Dvd that explains painting that picture, the colours used etc. I am a newbee to Watercolours..
Hi David, sorry to here about your gloomy weather over their, ours is set to hit 39 degrees here tomorrow, in Perth Western Australia so we have the opposite problems, and don’t need to encourage faster drying. lovely soft water colour painting, love your work, you mentioned that your daughter was over her in Australia, clever girl, talking of witch, could easily arrange for demos and master classes for you to run should you ever venture this far yourself, through the water colour society of W.A, just a thought, any way love your news updates, and best wishes. Derek P.S website is under an update just now. Hi David, thank you for the tip of using cartridge paper for sketches in damp conditions. I normally use standard watercolour paper, and it does take an age to dry. I am due to visit Devon in April, and will make sure I take some cartridge paper with me. Kind regards… Bill. First of all I would like to to thank and compliment you on your great article in the March issue of Leisure Painter. Since your suggestion in a previous blog of Daniel Smith’s w/cs, now thankfully available in 5ml size, I have been fortunate enough to acquire a few and absolutely love them. I have passed this on to several fellow artists and we find them most enjoyable and inspiring. However, I am in a terrible ‘lull’ with my painting at present, caused by the interruption of the festive season and all that it entails, finding it difficult to get painting again but I found such pleasure reading your article and also this blog again, I feel so much better. All I needed was my DB fix, thanks David !